Happy Christmas! Many thanks to all of you for your support and prayers during the past year: you are a great parish to serve and I greatly appreciate your time, commitment and generosity. My prayers during this Christmas season are for your families and friends, that we may receive every blessing from the Lord in this new year! Fr. Michael. As a bit of a thank you - all those who help out in the parish in any way: musicians; readers; cleaners; servers; handmaids; sacristans; SVP; welcomers; Knights; teachers; flower arrangers; counters and children’s liturgy etc. are invited to an ‘Open House’ gathering in the presbytery between 3.00 and 5.00 pm on Sunday 7th January. On First Saturdays, we will follow the request of Our Lady of Fatima and celebrate Mass in her honour for the conversion of sinners and in reparation for sins of humanity. Mass will be followed by a short period of exposition, a brief meditation on one of the Mysteries of the Holy Rosary and then Recitation of the Holy Rosary. Please commit to participating in the First Saturday devotions to Our Lady’s Immaculate Heart. Thanks to all who helped provide such a lovely Carol Service last Sunday and to all those who attended. The Food Bank organisers send their thanks for our recent donations. Items in short supply are UHT milk, tinned rice pudding, tinned fruit and vegetables and tinned meals. Please leave your donations in the basket in the porch at Christ the King. 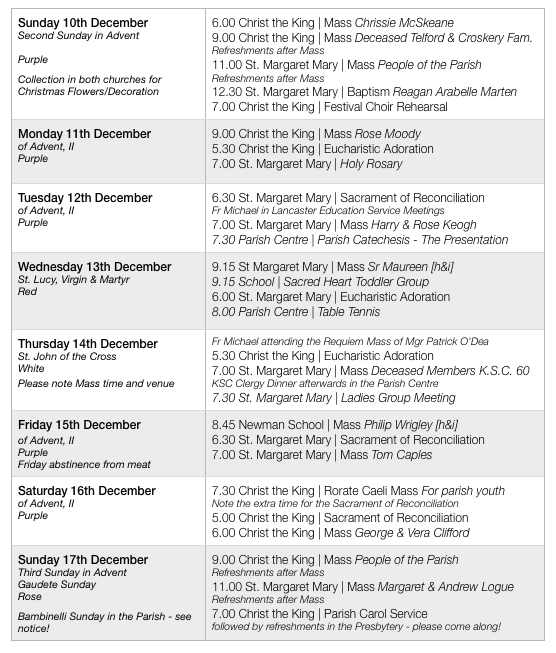 Numbers at Mass were Saturday evening - 43, Sunday 9.00 am - 59 and Sunday 11.00 am - 91. A total of 193. Thank you for the offering of £324.00 at Christ the King and £235.10 at St. Margaret Mary. The total being £559.10. They propose to hold a major fund-raising event (a variety show), That’s Entertainment, on Friday 11 May 2018, in the Sands Centre. Preparations are now well underway. Young people, ex-Newman pupils and local amateur talent will be taking part. Book the date! Fr Norman is also looking for an old metal bucket for the show. If you have one lying around in your garden or shed, please let him know - tel: 01228 538119. Thinking of applying to train to become a primary or secondary school teacher in Sept 2018 or know someone who does? If you are (or will be) a graduate, you could train with the Catholic Teaching Alliance in schools in Preston/Blackpool/Lancaster area. Details: www.catholic - teaching - alliance.org / Tel: 01772 326931. There will be a diocesan residential retreat for Servers, Year 6 and upwards, from Friday 16 February at 2.00 pm until Saturday 17 February at 2.00 pm. 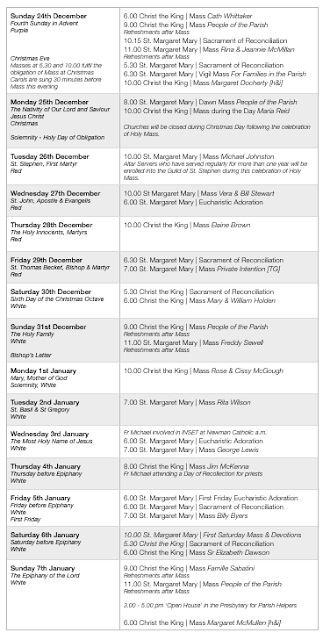 See the poster on the diocesan noticeboard in the foyer. Cost - £40, which the parish will pay. To book, contact Paul Briers, on 01946-834834 or guildshop@yahoo.co.uk. In our own deanery: On Wednesday 21 March, at 7.00 pm in St. Margaret Mary’s Parish Community Centre, Scalegate Road, CA2 4JX, Fr Michael Docherty will speak on “Eucharist: food for the journey”. 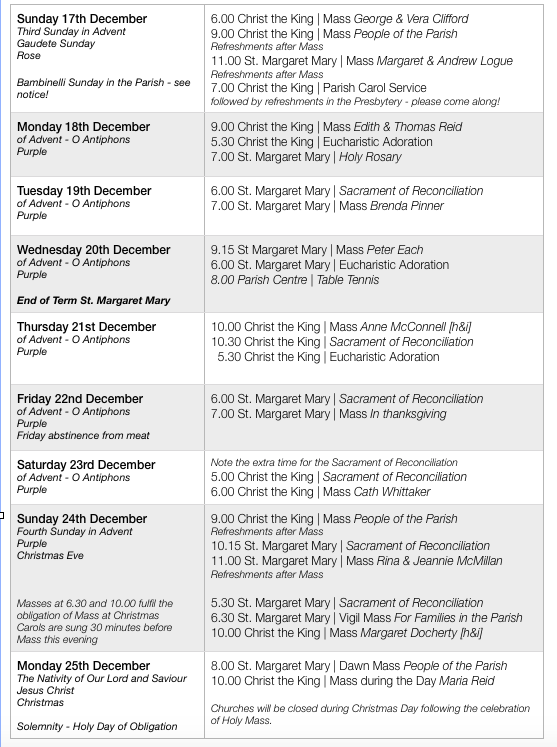 Please note the revised Mass times between Christmas and Epiphany. Why not make a spiritual resolution for next year? You could make a commitment to pray the rosary on a regular basis for a particular intention, attend the First Friday Mass and devotions, commit to visiting a neighbour who is alone on a regular basis, commit to reading Scripture regularly…have a think about it. This Sunday is Gaudete Sunday - but it’s also Bambinelli Sunday in the Parish! Bambinelli Sunday is the day to bring the child Jesus from the nativity sets in your homes to Mass for a special blessing! Bring them along next Sunday and after the distribution of Holy Communion, they’ll be blessed, ready to be placed in your cribs at home this Christmas. The Parish Carol Service will take place on this evening at 7.00 pm in Christ The King Church. Please make every effort to support this Parish event. It will be followed by festive refreshments in the Presbytery. Please come along. Volunteers are needed to sing carols for the residents on Tuesday 19th December. To meet at 6.00 pm at Pennine Lodge, which is at the top of Pennine Way, Harraby. Everyone welcome. Please make an extra effort to go to confession during Advent. See the front page for specific times. As a bit of a thank you to all those who help out in the parish in anyway: musicians; readers; cleaners; servers; handmaids; sacristans; SVP; welcomers; Knights; teachers; flower arrangers; counters and children’s liturgy etc. are invited to an ‘Open House’ gathering in the presbytery between 3.00 and 5.00 pm on Sunday 7th January. 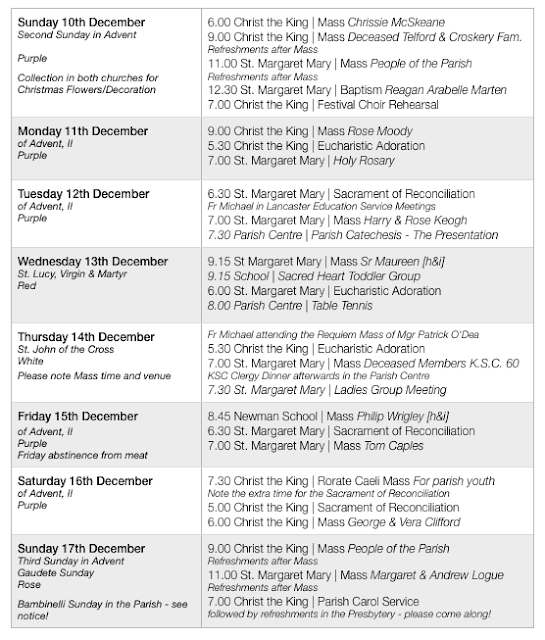 Numbers at Mass were Saturday evening - 47, Sunday 9.00 am - 66 and Sunday 11.00 am - 122. A total of 235. Thank you for the offering of £467.60 at Christ the King and £312.99 at St. Margaret Mary. The total being £780.59. “The Government is making a critical decision on whether to overturn the admissions cap which prevents Catholic schools from allowing all Catholic pupils to attend. It has acknowledged that this policy discriminates against Catholics and promised to abandon it. Now we need you to tell the Government not to u-turn on their promise to Catholics. Our diocesan pilgrimage to Lourdes 2018 takes place 20-27 July with flights from Manchester airport. 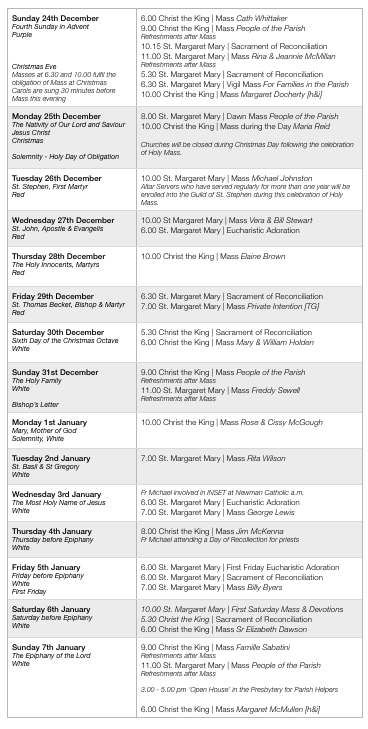 Brochures and booking forms are available from Fr Michael. Young people: Travel to Lourdes by coach with other young people from our diocese, 19-29 July. Open to ages Year 10+, 4-star hotel - £595. For more information, to book online or download the poster or booking form, please see: http://www.castleriggmanor.co.uk/new-events/2017/9/19/lourdes-2018. During the month of January, Philip Wrigley, a second year seminarian [someone preparing for priestly ordination] of the Diocese [and a Carlisle lad] will be in the parish for an extended pastoral placement. He arrives on the weekend of 6th January and I’m sure that you will make him very welcome! Please pray for him and for our other seminarians - Stuart Chappie and Stephen Talbutt. Money will not be provided for the building of a chapel in the new school and the Knights of St Columba have therefore undertaken to supervise the raising of £75,000 for this project. A major fund-raising event will be a variety show, That’s Entertainment, to be held on Friday 11 May 2018 in the Sands Centre. Preparations are now well underway. Young people, ex-Newman pupils and local amateur talent will be taking part. Book the date! Congratulations to staff and governors of St. Cuthbert’s Catholic Primary School for the successful recent Ofsted inspection where they were rated as ‘A Good School’. They featured on Border TV’s Lookaround this week! Places are available in the school. www.catholic - teaching - alliance.org. Tel: 01772 326931.